As part of my effort to accurately measure the technical specifications of various skateboard trucks, I'm always on the hunt for new ways to gather observations and depict them in a comparison. My most recent venture has been in trying to measure the placement of axles in relation to the truck mounting holes on the deck. I've mentioned before that some trucks place the axles closer to or further away from the center of the deck. The further toward the ends of the board the axle is placed (i.e., the further from the center of the board), the harder the effort to pop ollies and nollies. Anybody who's jumped from a board with Ventures to a board with Indys and back again will notice that difference right away. And, of course, most skaters are familiar with truck heights, at least in terms of "high", "mid", and "low" trucks if not the actual measurements. I built a new jig to measure the placement of the axles relative to the deck. I put truck bolts upside down into the centermost (kingpin side) truck holes and push the bolts against the side of the jig to align the truck. Then, I push the truck sideways until the axle touches the "wall". I mark the contact points with a pencil, then measure the distance from the edge. The measurements are not absolute, they are only relative to the centermost truck mounting holes and the jig itself, but for comparison purposes, relative measurements are perfect. 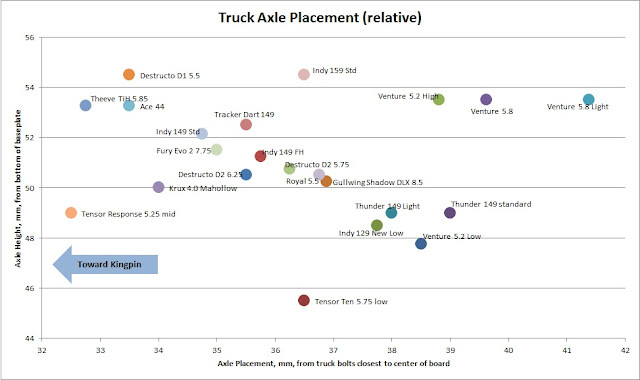 I'm only trying to determine the positions of axles relative to other trucks. In this way, skaters who like the way Indys feel on ollies and nollies but want to get something higher, lower, cheaper, more colorful, whatever, will be able to see what other trucks have axle placements similar to Indys. Likewise, if a skater is trying to get more effort or less effort on ollies or nollies, then the chart will show where other trucks' axles lie in relation to the trucks the skater is currently skating. Knowing relative axle placement will be especially helpful when a company stops making your favorite deck shape. If the deck manufacturer puts more or less flat between the endmost truck mounting holes and the curve of the tail or nose, your trucks won't feel the same on that deck, and you might want to get trucks that move the axle closer to or further away from the curve of the tail and nose. You can see that the Venture 5.8 truck is high and has an axle furthest from the kingpin. The Ace 44 has a high height but the axle is really tucked in close to the kingpin, making the effective wheelbase shorter and imparting a very quick feel to ollies and nollies. For now, have fun studying the chart, and please do ask questions in the comments section. Every question helps these measurements get more accurate and therefore making you a much more informed skater. never tought about the "axle placement" - nice to learn something new. Good job and thanks for your effort :)! Hey, maybe it ain't 100% the right thread - but I've got a question about the ACE trucks that you already tested. I've got a bad pair and can't say anything real about them but want to use them intensiv. Currently I'm riding a 8" deck but I think I want to go later to a bigger 8.25 or 8.5 deck. Do you think I can ride ACE 44 on 8" deck or do you think the wheels (58mm Spitfire) will stick to wide over the deck (Dogtown Pigskull 8" deck)? Another argument for the 44 are, that they are 13,22 USD cheaper than the 33. It would be great to hear your thoughts about that. 149s on an 8" deck isn't too bad. The Ace 44's axle is actually only 8.4" wide. You'll see your wheels, but you can help it by putting the speed washers on the outside, near the axle nut, and having no washer on the inside. Then you'll just see axle nuts, which is just fine. If you're going to be trying out 8.25" or 8.5", you'll want to stick with the Ace 44s. On the 8.25" deck, you'll only see your axle nuts. On the 8.5" deck, everything will be tucked under. I put the ACE 44 on while just use only the axle nut washer and it ain't looks so bad... from the top - you won't notice directly the wheel overhang. The trucks looks awesome wide - "good old school looking style" ;) The stock bushings are awesome and the factory setting of the axle nut is perfect. I just take the first rounds on the mini ramp and for my skateboarding - while getting into turns (not only "kick turns from side to side) it makes a lot of fun.. like you talk: damn deep turns but also very stable. Also "miss-footplacement" won't bail you from the board. Also I wouldn't say they grind down fast, on metal-coping, than other trucks (first impression). For me... ACE are currently my fav. trucks and I'm excited to use them at the weekend hopefully on bowl-/ pool- :)! The Ace trucks are good friends on transition and coping. I hope you continue to like them. You got it! I added in the Thunder 149 Light. The standard Thunder 149 would have a similar axle placement but it would be about 1.5mm higher in height. I knew from feel that Thunders sit between Indys and Ventures, but I was surprised how close the Thunder axles were to the Venture's measurements. "There is no difference between the two except the graphic. We just updated the old V graphic and added the word VENTURE in it. Hmmm. It must be the bushings, perhaps? The newer Ventures feel much better than the older ones. A very rough measurement of a well-used set of Thunder 145 LOs gives me 38mm and 48mm. Great! I'll add it to the database. Thank you very much. Huh, I'm a little tired at the moment since I just had a week of test hell, so can you elaborate for me? Right now I'm riding thunders and thinking of going Indy or Theeve, by this chart are you saying theeve's/indys take less effort to ollie due to their axle placement being closer to the bolts? Also any news on the Theeve v3 geometry fixing the bushings issue? I was thinking about getting the lows for the new geometry or possibly springing for the TiH; however, I'm still a pretty new/bad skater so I can't really justify the price unless they just last forever (or at least longer) for my size (6'1 225lbs). No skater is a bad skater, no matter how inexperienced. If you are putting in the work and remembering to have fun, you're a good skater no matter how many tricks you can or can't do. Thunders feel very different than Indy and Theeve. Independent and Theeve trucks are very easy to pop and both of the trucks turn and carve extremely well. You can ride either truck loose or tight and they feel great. I find that I have to ride Thunders tighter than I would normally ride in order to get a stable feel for ollies and nollies. The current fix for the Theeve geometry - the bottom washer and longer kingpin - didn't do much. But on the TiH, the yoke has a more prominent bottom lip, and this does help quite a bit. With the longer kingpin, you can put Bones hard bushings on the TiH and get a pretty durable bushing setup. Don't get the lows for the new geometry if you're not already skating lows. You're about the same size as I am. The TiH hanger will last forever, that much is apparent. It is extremely strong. The axle nuts, kingpin, bushings, and pivot bushing will probably wear out, but those are wear items anyway. That said, the TiH are really, really good street/flatland trucks. They are incredibly durable and extremely light. I took the TiH off of my ramp/park board and put them on my street board and I like them a lot better for street. If you want Theeve, and you want to do ramps with metal coping, I recommend the TiAX. If you're skating bowls, the TiH would do better because they're more durable on the concrete coping. I expect to be mostly a street skater, I did do vert before when I inline skated but I don't think I'm going to be going back to that for awhile so I guess the TiH will work. But I'm thinking maybe I should just try the TiAx low (unless you think the new geometry isn't worth it and I should just get a regular tiax or tiking) and see how it goes, get better and then move onto the big boys once I've earned it haha. Thanks again, you're the man! You are correct, the low Theeve trucks have the prominent bottom lip, too. A lot of people have been very happy with the lows. Your plan to get some TiAX lows for now sounds like a good one. The TiAX trucks last longer than normal trucks, so you'll have good durability. It takes me about a day to grind decent locks in trucks like Indys or Ventures, but it takes about a week and a lot of grinding to get the same locks in TiAX trucks. The first lock I always grind is the frontside 50-50, then I k-grind the krooked grind lock on the front truck, then I do pivot turns on a low cement curb until the back truck has a nice lock right where I do frontside/backside pivots or 5-0s. Great graph! I saw you made a post about the ACE 03 low trucks and wonder if you ever made any measurements of them? I'm skating ACE 33's but I'm curious about the 03's and it would be interesting to see some measurements!